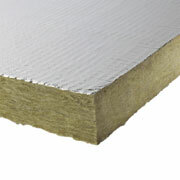 PAROC Fire Slab 100 AluCoat is a non-combustible stone wool slab for thermal and condensation insulation of ventilation ducts and other ventilation equipment. It has a reinforced aluminium foil facing which prevents condensation. It is a non flexible slab which makes it ideal for installation on flat surfaces.